Markets are giving up some of their recent gains this morning as Hurricane Florence weakens to a Category 2 storm on its approach. The storm is expected to do severe damage along the coast as it pauses and crawls south, but impacts on major fueling pipelines should be limited. Eastern Carolina is already starting to feel the rain from Florence, and landfall is expected to occur either tonight or tomorrow. More news will be shared in our FUELSNews Storm Alert later today. 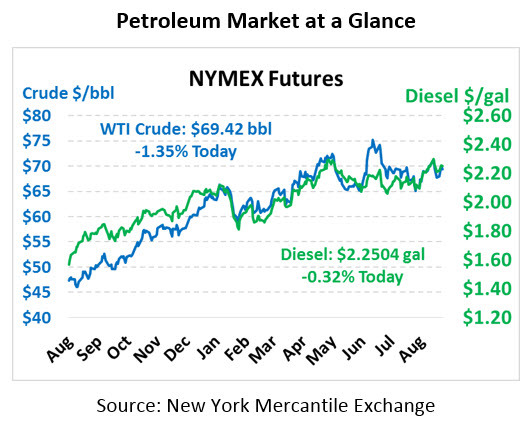 After rising from a low of $67.50 on Wednesday to a high above $71 yesterday, crude oil prices are cooling off a bit. It’s common to see price surge ahead of a major storm and subside as it passes – it appears markets are already baking in a non-event for global supply markets. Crude oil is trading at $69.42 this morning, shedding 95 cents (1.4%) since yesterday’s lofty close. Like crude, fuel prices are dipping down as the threat to the Colonial and Plantations Pipelines, which run through the Carolinas, subsides. Diesel prices are trading at $2.2504, down 0.7 cents. Gasoline is at $2.0200, a loss of 1.5 cents. The International Energy Agency (IEA) pointed to a tightening of global supplies in their latest monthly oil report, giving markets a bullish bent. 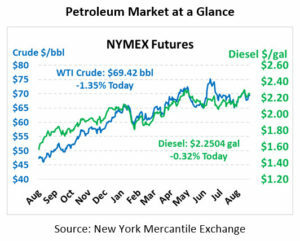 Global demand is approaching 100 million barrels per day, but economic growth is under threats, including currency depreciation in emerging economies and on-going trade disputes between the US and China. As supplies tighten, new supplies will be tapped to meet demand, using up spare capacity and making it more difficult to weather any new surprise outages in other areas. The EIA released their weekly inventory report, which showed a large draw from crude stocks but a comparably larger build for refined products. Still, markets took the report as bullish given the uptick in refinery utilization – somewhat unusual for this time of year – and the draw in Cushing crude stocks. Another bullish point was the drop in Lower 48 crude oil production – the first such drop since January! As limited pipeline capacity creates constraints on getting crude to market, producers are slowing their production to wait for pipelines to come online next year.